Glyphosate: The toxic chemical lurking in your food. In 2015, 17 experts from 11 countries came together at the World Health Organization’s International Agency for Research on Cancer (IARC) to assess the carcinogenicity of a certain category of pesticides. Glyphosate was one of these. Glyphosate was introduced by Monsanto in 1974 under the brand name Roundup. It is an effective broad-spectrum systemic herbicide which supresses or kills ALL plant types. Previously, glyphosate use was only permitted for use post-harvest for controlling weeds between trees, vines or nut crops. However, as previously mentioned – this chemical kills every plant it comes in to contact with, so in order to combat this fact, seeds have been genetically engineered to be resistant to it. This in turn creates crops that are not affected by the killing power of glyphosate, and allows farmers to spray entire fields with the stuff without the fear of killing everything in it. Common GM crops resistant to glyphosate include corn, soybean, canola (rapeseed) and cotton. This fact has therefore changed the use of glyphosate from a post-harvest chemical to one used on annual crops. It therefore appears that glyphosate is not being used in the way it was originally intended. According to Monsanto, glyphosate works by inhibiting essential growth enzymes in the plant in which it is targeting. “When Roundup brand herbicide is sprayed on foliage, glyphosate is absorbed by the plant and then moved – or translocated – throughout the plant’s tissues. The surfactant assists the delivery of glyphosate into the plant by attaching itself to the leaf’s waxy surface and breaking it down. Once inside the plant, glyphosate inhibits the activity of an enzyme, which in turn prevents the plant from manufacturing certain amino acids essential for plant growth and life. “… prevents the plant from manufacturing certain amino acids essential for plant growth and life” AND “ Ultimately, the entire plant dies, and is incapable of regrowth”. When used at lower levels than it was originally intended, glyphosate acts as growth regulator and desiccant. Crop desiccation refers to the application of herbicide just prior to harvest. Glyphosate is one of the most common herbicides used to desiccate crops. It’s use results in a more even or earlier ripening by reducing the green material in the crop (as it essentially starts to kill it) which therefore allows the crop to be harvested earlier, this in turn reduces the strain on machinery and replanting can begin sooner. Glyphosate use was previously limited to post-harvest weed control between established rows of trees, vine and nut crops. These days, it appears farmers are using it more and more for expediency – to basically reduce tilling practices and reduce labour and fuel costs. 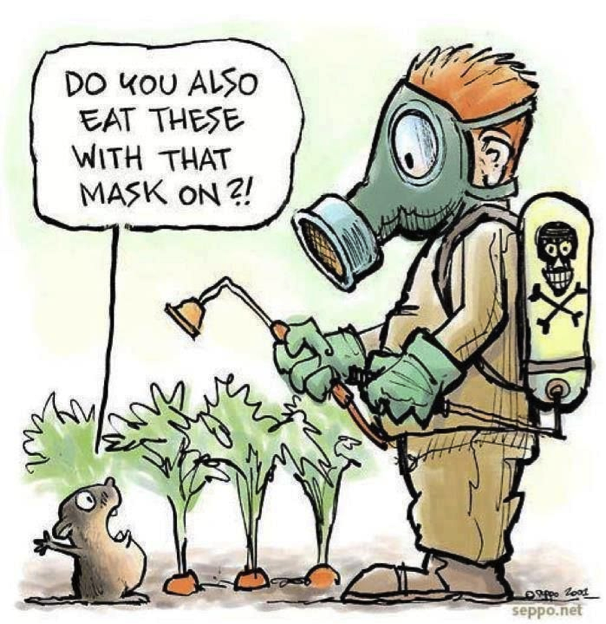 Because this chemical is so effective at killing all that it comes into contact with, the scientists at Monsanto decided to genetically engineer crops to be resistant to it. In 1996 Round Up Ready soybeans were introduced to the world. Glyphosate resistant (aka genetically engineered crops) also include corn, alfalfa, canola, sugar beets and cotton. According to Transparency Market Research (2014), production of these crops alone accounted for 45% of worldwide demand for glyphosate in 2012. 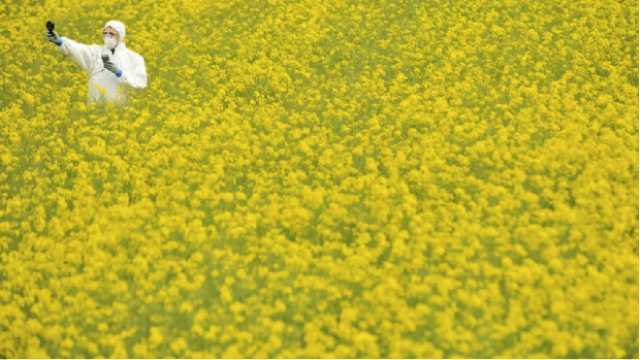 · Homeowners – to kill weeds near footpaths and in and around gardens. The report highlights that the last major review of pesticide use in Australia was a Report in July 1990 of the Senate Select Committee on Agricultural and Veterinrary Chemicals. One can assume that much has happened since then in terms of farming systems, pesticide application and overall use – yet there remains no integrated and comprehensive reporting system in Australia. The ATSE report published in 2002 recommended that such a system be implemented to ensure the integrity of the quality of Australian agricultural produce. Yet here we are, 14 years later, and we still don’t have an integrated comprehensive system in place. In comparison, in the United States, many States have strict pesticide reporting requirements. 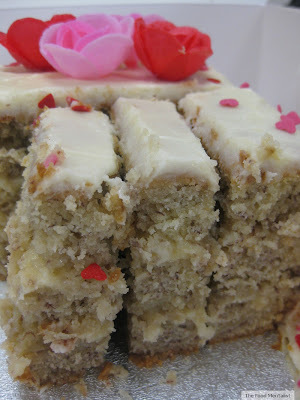 The latest Australian household expenditure survey results indicate that weekly household expenditure on food and beverage by type shows that bread, cakes and cereal products remain the second highest food type purchased after meat. In addition, Australian food imports increased to $11.6 billion in 2012-13, $280 million (or 2.5% higher) than in 2011-12. The main reason for this increase was a significant increase in the numbers of bakery product imports – an increase of $63 million (or 13.9 per cent). Figure 1 Data Source: FAOSTAT (Amount in Millions (tonnes)). 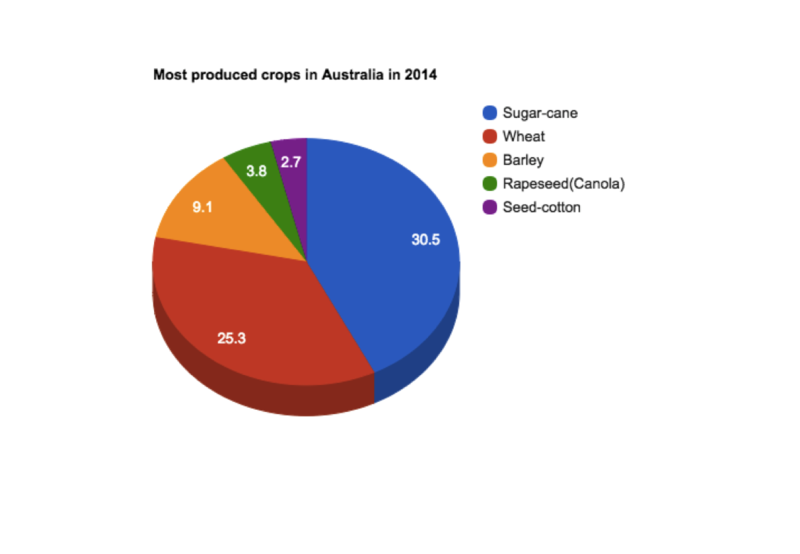 With an increase in demand for domestic and imported grain based products in Australia, it is paramount that Australian authorities implement a more comprehensive system for the monitoring and use of glyphosate and other pesticides used on consumable crops. “MRLs for pesticide residues and residues of veterinary drugs are the maximum concentrations of residues to be legally permitted in or on a food. MRLs for pesticides may also be applicable to animal feeds” – World Health Organization (WHO) – 2008. The Codex Alimentarius Commission (Codex) sets the International standard for MRL’s. It is the principal organ for the joint Food & Agriculture Organization of the United Nations (FAO)/WHO Food Standards Programme. Even so, countries are not bound by the MRL’s set by Codex. In Australia, schedule 20 of the Food Standards Code sets the MRL’s. Food Standards Australia New Zealand (FSANZ) and the Australian Pesticides and Veterinary Medicines Authority (APVMA) share the responsibility when it comes to MRL’s and can submit proposals to FSANZ to have an MRL reviewed and ultimately changed. At present, FSANZ is considering a proposal by APVMA to match Australian laws with those overseas. Final approval is expected in March 2017. 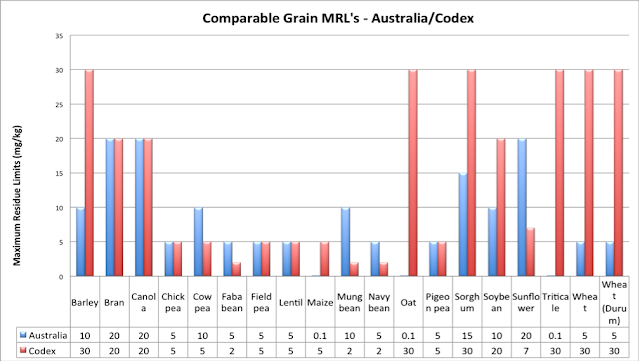 The Codex MRL for Oats is 30. Any basic Internet search will show that many studies (scientific and otherwise) have been conducted on the effects of glyphosate on humans and animals. Claims of cell damage, liver and kidney damage, lower immune function, gastrointestinal disorders, infertility, obesity and Alzheimer’s are many. It seems that as soon as a study is released which indicates glyphosate does in fact have detrimental effects on the health of humans – Monsanto, its original creator, funds a new study which discredits it. That is why the IARC Report released in 2015, is of great significance. It reports that in 2014, Sri Lanka implemented a partial ban on the use of glyphosate as a result of an increasing rate of chronic kidney disease among agricultural workers. However, the ban was lifted after only 2 months. No reason for the ban was given and it appears no limits for occupational exposure to glyphosate can be identified. 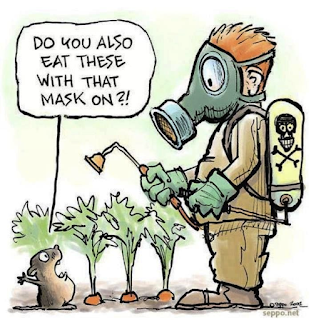 According to Grossman (2015) the U.S government does not test pesticide residue levels of glyphosate in food, nor do they monitor the levels in human blood or tissue. This makes it hard to understand exposure levels for people who may use it in their gardens at home, eat foods covered in it, or simply live near a farm that has been sprayed with it. In 2011, a study was conducted on an urban population in Berlin to determine if only those who were in direct contact with glyphosate were at risk of toxic exposure. To do this they tested the urine of journalists, lawyers and city workers who had no direct contact with the pesticide. The drinking water limit is 0.1ng/ml. A possible explanation for this could be that glyphosate is now used on Roundup Ready genetically modified crops that are resistant to it, and therefore ‘dosed up’ prior to harvest. Also, pre-harvest application as a form of desiccation is also of great concern. With increased use comes the concern that it can enter our groundwater supplies. So never mind eating it, we may actually be drinking it. In fact, in 1993, the Environmental Protection Agency (EPA) in the United States reported that glyphosate can be found in air, soil, surface water and groundwater. The IARC Report found that general population exposure to glyphosate is mainly through the consumption of food. There is limited evidence in humans for carcinogenicity of glyphosate. A positive association has been observed for non-Hodgkin lymphoma. In its ‘Overall Evaluation’ the IARC states, “ Glyphosate is probably carcinogenic to humans (Group 2A). From reading the IARC report, it is interesting to note that the data available for analysis on animal testing is much more comprehensive and allows for a greater analysis of the effects of glyphosate. For example, direct absorption rates and organ tissue data for humans was not available to the IARC Working Group, which indicates it is rare or perhaps non-existent. However, similar data on animals does exist and was used for analysis by the IARC Working Group. As highlighted by Grossman (2015), the U.S Government does not monitor the levels of glyphosate in human tissue or blood and there appears no data to support the idea that the Australian Government does either. If the IARC evaluation states that there is SUFFICIENT evidence to suggest glyphosate causes cancer in animals. That glyphosate is PROBABLY carcinogenic to humans. It is evident that the data available on human exposure is less comprehensive than the data available on glyphosate exposure to animals. Shouldn’t we be looking at banning this toxic chemical from being used on our food and in our environment? As Australian’s we have reason to be concerned as it appears Australian authorities are somewhat slack in banning chemicals in order to safeguard our health. For example, the highly toxic pesticide Endosulfan – often used on grains, fruit and vegetables, teas, nuts, cotton and tobacco was only banned in Australia in 2010. Long after it had already been banned in over 60 countries throughout the world. Duke& Powles 2009; Dill et al 2010. Report of the Senate Select Committee on Agricultural and Veterinary Chemicals in Australia, 1990. Australian Academy of Technological Sciences & Engineering Ltd, 2002. Australian Bureau of Statistics (ABS), 2011. Brändli, D & Reinacher, S. 2012.